As we enter our 12th year in 2019, the Marcus Graham Project (MGP) has successfully trained, mentored and invested over 12,000 hours in the exposure, training and mentorship of the next generation of marketplace leaders in the media and marketing industry. We hope that you will designate a reccuring or monthly donation to help sustain our mission and vision. 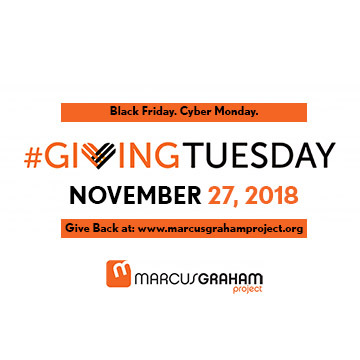 Donate 100% - Add 3% so that 100% of the donation goes to Marcus Graham Project. Marcus Graham Project has partnered with Network for Good to securely process your online credit card payment via Network for Good (tax ID 68-0480736). This transaction will appear on your credit card statement as "Network for Good." This transaction is subject to Network for Good’s Privacy, Security & Disclosure Statement and the Charitable Solicitation Disclosure. © Copyright 2017 Marcus Graham Project All Rights Reserved.